(June 07, California, Sri Lanka Guardian) A monk in yellow robes was somewhat of a novelty to the audience of 50 or so people gathered at the Parkway United Church of Christ in Minneapolis (3120 Washburne Ave.). Kathy Itzin, the pastor of the church, had invited the monk to speak to her congregation on Buddhism about which they knew little. The monk and the pastor had never met before. But Itzin had heard about the monk’s involvement with community activities by word of mouth. Although she didn’t know how to address him or pronounce his Buddhist name, she greeted him cordially on a Thursday (24 March 2011) evening while her congregation was chitchatting in groups enjoying coffee, soup and bread to while away the time. The monk was the indefatigable Ven. 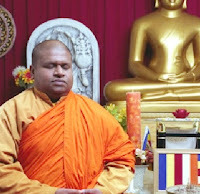 Witiyala Seewalie Thera, 40, president and abbot of the Minnesota Buddhist Vihara. Ven. Seewalie founded the vihara 30 March 2004 and kept it going through cultivating community support. He has run the vihara as a nonprofit charity ever since. Before establishing the present temple (3401 N. Fourth St., Minneapolis), he shared the premises of the Thien An (Vietnamese) Buddhist Temple (1030 Third St N.E.) in Blaine, Minn. Susantha Herath, a professor of business computer information system at Saint Cloud State University, was the principal backer of the temple project. Ven. Seewalie faced the audience, recited “Namo Tassa Bhagavato Arahato Samma Sambuddhassa” (Homage to Him, Blessed One, Worthy One, truly and completely Awakened One), and told the gathering that he wished to speak on the fundamentals of Buddhism in simple terms. The audience listened with rapt attention as Ven. Seewalie explained the Four Noble Truths—life means dukkha (unsatisfactoriness), attachment is the origin of suffering, cessation of dukkha is attainable, and the Noble Eightfold Path is the way toward cessation of dukkha. Ven. Seewalie was well prepared to meet the challenge of addressing an American audience. Past experience had taught him to use slides to make him understood better. The audience responded positively because they could grasp the meaning of words he enunciated with a Sinhala accent by reading the text on the slides. By the time he elaborated on the three dimensions of the Noble Eightfold Path—sila, samadhi and panna—the audience appeared to have an understanding and appreciation of what Buddhism meant. After all, four of the Ten Commandments shared by Jews, Christians and Muslims constitute four of the five precepts of Buddhism—thou shall not lie, steal, kill unnecessarily and engage in sexual misconduct. After the sermon, many came to wish the monk well. Some said they would visit the vihara to get information. The audience did not ask any hostile questions. The monk’s emphasis was on what is common to all major religions, not on the differences based upon the existence of God. Ven. Seewalie has become familiar with scenes similar to the above in his tireless effort to spread Buddha’s teachings among the American hoipolloi. Excelsior businessman James K. Bowers donated the use of his farm property to the MBV on the suggestion of a Sri Lankan friend of his whom he had known for 40 years. The MBV currently uses the MRC in Rosemount for holding summer meditation retreats, conducting cultural events and for free housing of out-of-state visitors. For example, a team of Sri Lankan dancers used the farmhouse of the MRC as their headquarters for almost a month. Ven. Seewalie also is involved in the rehabilitation of some 30 prisoners at the South Dakota State Penitentiary in Sioux Falls, S.D. Every month, the MBV monks and the only bhikkhuni of the vihara travel to Sioux Falls to discuss Buddhism and practice meditation with those prisoners who have decided to focus on Buddha’s teachings. Ven. Seewalie says, “At the beginning, I had the difficult task of building up people’s trust and confidence in me and the program.” However, his persistence ultimately throttled that roadblock. Ven. Seewalie said that he was very satisfied with the response of the prison population to the MBV rehabilitation program. He was pleased with some of the feedback he has received from the participants. Ven. Seewalie illustrates his community outreach by serving as a chaplain for the Minnesota Police Department and by serving as a notary public. Additionally, he is a member of the Minnesota Emergency Service Chaplain Association. The Spiritual program of Grand Forks Air Force base invited him to conduct a meditation program. In his ardor for spreading the Buddha’s word, Ven. Seewalie has focused his attention on students in the neighboring universities. He has been adviser to the Sri Lanka Student Association of the University of Minnesota, Twin Cities. He has delivered instructions on Buddhism to students at Bethel University, St. Paul. At Bethel University on 3 Nov. 2009, Ven. Seewalie participated in an interreligious symposium to explain the Theravada Buddhist approach to meditation. Every semester, students from neighboring colleges and universities have visited the MBV for spiritual instructions and interviews on Buddhism. Ven. Seewalie has also visited the St. Cloud State University to advice students on Buddhist doctrine. He has also established relations with several other universities: University of Wisconsin-Superior, North Dakota State University in Fargo, Iowa States University at Ames, Oak Hills Christian College, Minneapolis Community Technical College, Century College, St. Cloud Technical College, Hennepin Tech., Meadow Creek High School, Concordia College, Hamline University, Macalester College, Augsburg College, St. Thomas University, Metro State University, and St. Scholastica College. MBV resident monk Bhikkhu Bisho Kirti, Bhikkhuni Satima and Ven. Seewalie have conducted a fortnightly Sunday Dhamma school at the temple premises since 2005. The vihara also has organized classes in Buddhism and meditation for adults every week. The temple also organizes annual events of cultural significance to Sri Lankans—e.g.. Sri Lankan Alut Avurudda, Autumn Get Together. The temple also celebrates the Buddhist Vesak festival and the annual robe-offering ceremony (Kathina).